Rheilffordd Llyn Tegid (Bala Lake Railway), a delightful 9-mile return journey alongside Bala Lake, in the beautiful Snowdonia National Park. 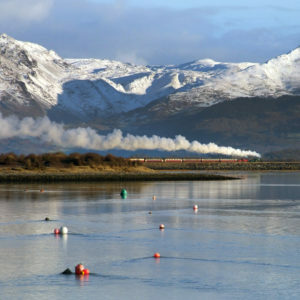 The 9-mile journey offers extensive views of Llyn Tegid, and its surrounding countryside with mountain views of Arenig Fawr, Aran Benllyn and Aran Fawddwy. 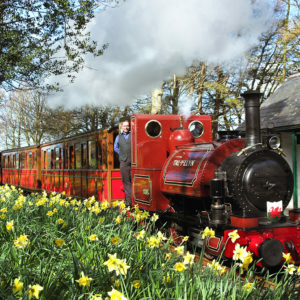 Rheilffordd Llyn Tegid (Bala Lake Railway) offers a delightful 9-mile return journey alongside Bala Lake, through the beautiful Snowdonia National Park. All trains start and finish at Llanuwchllyn station with its café , locomotive sheds and heritage centre. Bala Lake Railway is a wonderful mix of narrow-gauge trains running along the trackbed of the former Ruabon Barmouth line of the Great Western Railway between the peaceful village of Llanuwchllyn and what was Pen-y-Bont Halt situated on the opposite side of Llyn Tegid (Bala Lake) to the market town of Bala. 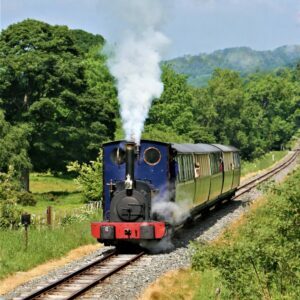 Opened as a narrow-gauge railway in 1972, its growing collection of steam locomotives are all over 100 years old. 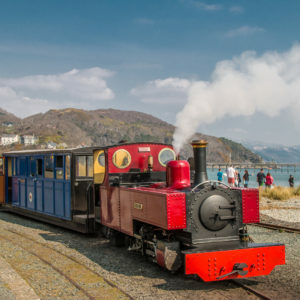 The railway hosts the largest collection of ex-quarry Hunslet engines anywhere in the world, with all but one having worked the Dinorwic slate quarry at Llanberis. In addition to these historic locomotives, the railway has a growing collection of heritage rolling stock, carriages and slate wagons. Bringing the lost world of a once huge industry back to life. The railway uses the original standard-gauge station buildings and signal box of the once tranquil wayside station at Llanuwchllyn. Passengers are normally able to visit the working signal box, heritage centre and locomotive shed (subject to maintenance activities). 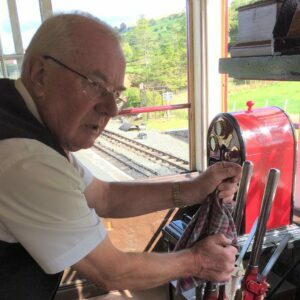 The smaller scale of the railway operation and the old buildings and locomotives means the railway staff and volunteers have time to treat passengers on an almost individual basis. 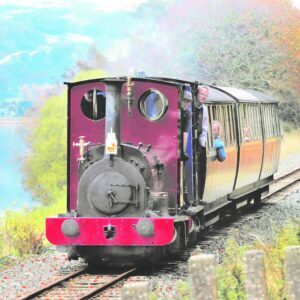 The Bala Lake Railway Trust is working towards raising £2.5 million as part of its Red Dragon Project to construct an extension of the Bala Lake Railway to Bala Town Station, right in the heart of the town. The nearest railway stations are at Ruabon (between Shrewsbury and Chester) and Barmouth (on the Cambrian Coast Line). The T3 bus connects both stations and also stops near Llanuwchllyn station. The TrawsCymru T3 bus service runs from Wrexham to Barmouth. Get off at the Llanuwchllyn stop at the end of Station Road (tell the driver you want the train), then it is a 5-minute walk to the Station. Rheilffordd Llyn Tegid (Bala Lake Railway) HQ is at Llanuwchllyn, at the South-Western end of Llyn Tegid/Bala Lake. This is the best place to start your trip. Travelling along the A494 you need to turn into the village of Llanuwchllyn. Towards the end of the village look carefully for the brown tourist sign and turn left into Station Road, cross the river bridge and the entrance is in front of you. Ample free car parking is available within the station site, at Llanuwchllyn. Turning and parking facilities for pre-booked coach parties can also be provided.